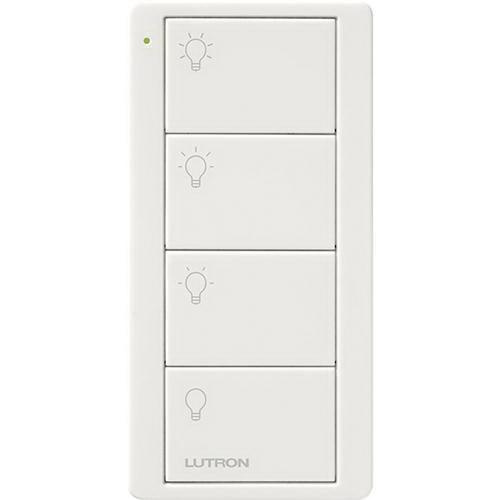 Lutron Pico® 2-Button wireless remote control in white color, offers control for Caseta® wireless controls, Energi Savr NodeT, Quantum® and myRoom™ systems. It measures 2.6-Inch x 1.3-Inch x 0.31-Inch. It provides control of blinds, curtains or lighting devices within a range of 30-ft through walls and 60-ft line-of-sight. This remote control has voltage rating of 3-Volts and current rating of 10-Milli-Amps. It has frequency response of 431 - 437-Mega-Hz. This wall mountable handheld remote control with 2-group switch control, runs on battery with 10 years of operating life. It serves as a scene or zone control in GRAFIK Eye® QS wireless applications. It withstands ambient temperature rating of 0 to 60 deg C. Wireless remote control is FCC certified, IC certified, Cofetel certified, SUTEL certified and Anatel certified.